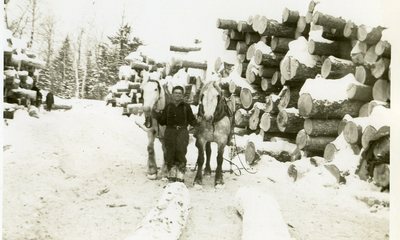 "Logging Camp Worker with Horse Team "
An image scanned from a black and white photograph of a man with a team of horses. They are standing in front of a pile of logs covered in snow. The photograph has the number "912" stamped on the back, but it's not clear whether it refers to or whether it indicated the date of the photo. No other information appears on the back.